Anyone who has had to ansarry and transport coolers on a regular basis knows just how difficult it can be. When you are talking about a full cooler that needs to go from the car to the field, gym or picnic area, it can be rather tiresome. This is especially true if you hardly have any help and need to complete these kinds of tasks on your own. The answer is to pick up the best wheeled cooler for your needs. We have taken a look at the different coolers with wheels and are proud to bring you the best rolling cooler reviews. However, before we get there, there are some things that you need to keep in mind before you buy. As everyone is different, there will be different needs for each person. Some may be the same, but you may find some unique to your situation. Here are a few things you should consider as you look at the different models more closely. While this one may not sound that important, you need to think about it. If you are taller and need to crouch lower in order to hold the handle as you roll, then you may be in for some difficulties. If you need to roll your cooler for extended periods and extended distances, and will need to crouch down for long periods at a time, then you may want to consider a cooler with a longer telescopic handle. Wheel size makes all the difference. Just think about actual vehicles and this will make much more sense. How do you think a car with smaller wheels will do on rough terrain? Now, how do you think a truck with off road tires will do on rough terrain? As you can see, the answer here is that the latter will do much better. 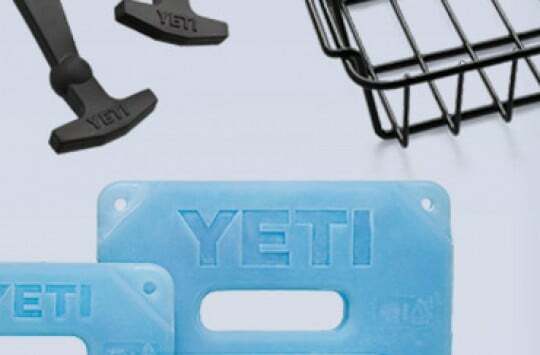 Much of the same can be said of your rolling cooler needs. If the area you will be using the cooler has rough terrain, then you may want to consider a cooler with larger wheels. When it comes to transporting your new cooler, then dimensions will come into play. Handles and wheels attached to your cooler can make it awkward to transport and difficult to place into trunks or backseats. 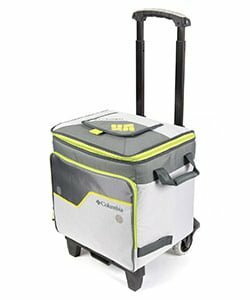 If you are traveling on a plane and will be taking a wheeled cooler, then it can become even more difficult. One of the things you should be paying attention to is the size of the cooler, as well as the attachments such as wheels and handles. 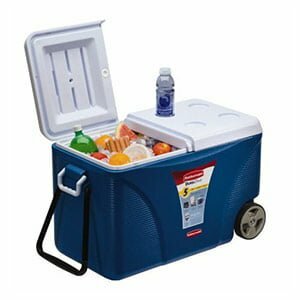 Keep these areas in mind before you purchase your rolling cooler and you should find the best wheeled cooler for your needs. Here’s a closer look at our top four picks when it comes to the best rolling cooler. 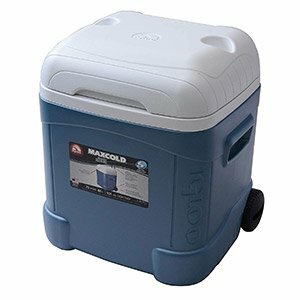 The popular Igloo Cooler offers a rolling coolers in various sizes and options, including those with MaxCold technology (check the price of each on Amazon). 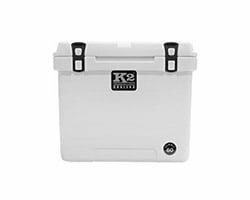 Durable wheels helps this cooler to stay off of the ground and tow handles make this cooler easier to carry. Ultratherm insulation in body and lid helps keep things cold. A taller user liked the handle being on the back of the cooler instead of the sides. The user mentioned that coolers with side handles typically have left him dragging it because of the elevation due to his height, but that was not a problem with this version. 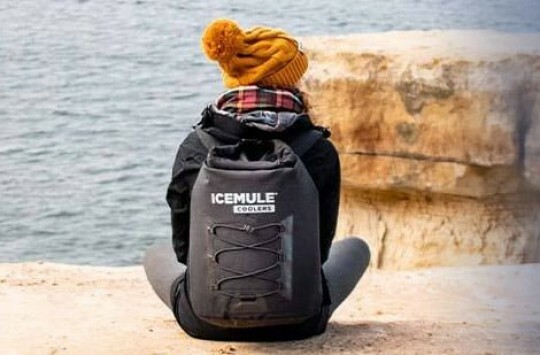 The user also mentioned that they got five days of ice retention, which matches up with what the manufacturer mentioned. Another user mentioned what others have about the wheels and handle, mentioning that the larger sized wheels were ideal for going over rocks or any other rough surfaces. 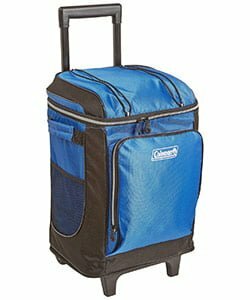 If you have been on the lookout for a rolling cooler that is on the soft side, then you need to check out this Coleman 42-Can wheeled cooler (Amazon link). Just as the name indicates, the capacity of this cooler is 42 cans. With a telescopic handle and wheels, you’ll find this one easy to transport as well. It measures in at 11.42 x 12.6 x 21.26 inches and weighs just over five pounds, making it lighter than others. The lightness can be attributed to the soft-sided body and exterior. Editor’s TIP: Here you can learn more about soft coolers. One user liked that this cooler was mid-size. 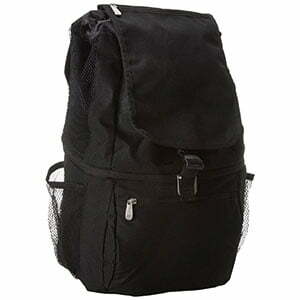 The user mentioned also liking the lining of the cooler, likening it to a plastic lining in a wastebasket. The user mentioned that the lining made it much easier to clean and remove. Another user took it on a trip to the beach and found that it functioned well. The user mentioned that it had nice extra pockets, smooth wheels and gave great capacity without it being too big to transport and handle. One user enjoyed many features of this rolling ice chest, prompting us to feel that the user saw it as the best cooler with wheels. 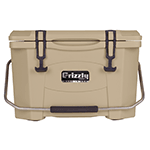 Of things to note, the user enjoyed the collapsibility, the height of the handles, the look of the cooler, removable liner, leak proof ability and small flip top for easy grabbing of items. Another user also mentioned the ability to break this cooler down. The user said that the removable wheels and fold up capabilities made it easy to pack directly into a suitcase to take on a trip. Some had mentioned that it does have some issues rolling over grass, but that it rolled well on flat surfaces. Are you looking for a LARGE cooler with LARGE ice retention rates? If you are then that is what Rubbermaid is offering . The manufacturer reports that this cooler will fit over five cases of cans WITH ice. They also state that the thicker insulation allows for ice retention of up to five days. 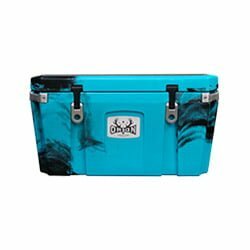 This model comes in at 16.9 x 33.3 x 19.4 inches making it perfect for the individual looking for a larger rolling cooler. Users did mention some initial hesitancy due to the large size, but found that they fit nicely into the back of their vehicles. One user stated that the cooler remained in direct sunlight for four days with items still remaining cold. Other users applauded the ability of these coolers to keep ice frozen. Two separate users mentioned that ice was still frozen even after three days in warmer temperatures. And yet another user reported ice retention of three days even with the cooler sitting out in the open under the sun. Editor’s TIP: More tips on choosing the best high end coolers can be found here. Your needs will determine the size and make up of the cooler that you need. How many people will this cooler serve? What terrain will you be going over? How long do you need ice to be kept frozen? Once you can answer these questions we are certain that you will be able to find a cooler to fit your needs here. Take a look at what you will need the cooler for and what you need it to do, and you will be well on your way to finding the best wheeled cooler. We recommend that you check out all wheeled coolers available on Amazon. 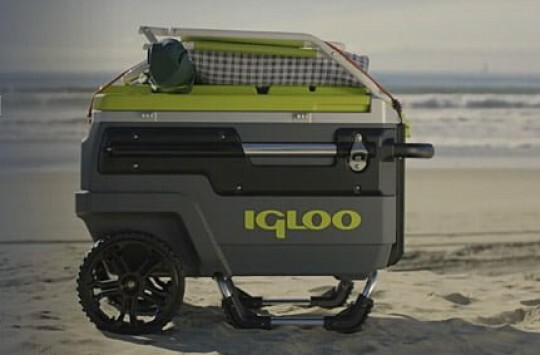 You can also check this Igloo Coolers video about their whole new wheeled cooler’s handle design. Awesome. Camping, fishing and biking can all be hard and thirsty affairs. I want to bring a cooler along. Thanks for sharing!